NY Times & USA Today Bestselling Author - Steena is the author of the heart wrenching Finding Emma series. The Word Game was included in the Top 20 Novels to be Written by Women in 2015 by Good Housekeeping. Her latest novel - The Word Game won the 2015 USA Books Award for Best Fiction and her novel, The Memory Child was a finalist in the same category. 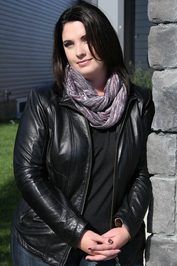 She currently lives in Calgary with her husband and three daughters and loves to wake up to the Rocky Mountains ea NY Times & USA Today Bestselling Author - Steena is the author of the heart wrenching Finding Emma series. To ask Steena Holmes questions, please sign up. Steena Holmes Currently I'm writing Before the Storm - a prequel to Stillwater Rising - which I hope readers will enjoy. If so, I want to know about it! My kindle is full, my night stand has 3 stacks of unread books on it and yet, nothing is calling to me. I always think I'm ready for a Kimberly Belle novel. I know it will be a page turner, the beautiful cadence will tease me, the characters will be so well developed I feel as if I know them. What I'm never ready for is Be prepared for a book-hangover! I know it will be a page turner, the beautiful cadence will tease me, the characters will be so well developed I feel as if I know them. What I'm never ready for is the ride Kimberly takes me on from start to finish. I 'think" I know what is happening, how the book will finish but then with whip-lash accuracy, things twist and unwind and by the time I finish the last word of her novel, I'm struggling to process everything I'd just read. Once again, Kimberly Belle hooked me from beginning to end with Dear Wife and I can't wait for everyone else to enjoy this book as much as I have! OMG! She did it again! Seriously...every single time I think I know what's happening, with a subtle twist, she spins things around so that I didn't see the end coming. I loved this novel! Highly recommend!!! "If you enjoy a book with family secrets, unreliable narrators and a guessing game of what’s true and what isn’t, this book is for you! This was my first book by this author, the writing is excellent, it will definitely not be my last! We’d love your help. Let us know what’s wrong with this preview of The Forgotten Ones by Steena Holmes. Loved it so much, I ended up purchasing book 2 as soon as I hit end! We’d love your help. Let us know what’s wrong with this preview of Year One by Nora Roberts. We’d love your help. Let us know what’s wrong with this preview of Overlord by David Wood. We’d love your help. Let us know what’s wrong with this preview of Of Blood and Bone by Nora Roberts. I was surprised by this story! It was the first time I've read anything by Mads Peder Nordbo but I really enjoyed it! I felt like I was in the setting, immersed in the culture and I got lost in the story! Do I recommend? Absolutely! We’d love your help. Let us know what’s wrong with this preview of The Perfect Girlfriend by Karen Hamilton. He plopped down onto the divan next to her, his multi-colored arm stretched along the back. Hello Steena! At this moment my favorite book is, I am The Chosen King by Helen Hollick. Hi Steena, thanks for being a friend. I’m looking forward to getting to know you. I want you to know that if you ever have any questions about the books on my shelves or about eHarlequin.com, I would be delighted to answer them. Also, I list as much eHarlequin news and author news as I can so be sure to watch for my updates.